To every company employer, it is easily known that the less time a staff member spends on the job during working hours, he/she is more likely an irresponsible, incompetent hired employee. In such cases, an employer should consider whether to start an evaluation on employees' performance. Because this will provides support points on deciding a dismissal. With this kind of business demands, it is important for a company to seek an ideal software. Surveilstar is absolutely essential fit their monitoring employee working performance situations. What Surveilstar can do for monitoring employee performance? Surveilstar enables a real-time monitoring on employees' computer terminals. Every monitoring computer has access to view live screens, immediate affairs, log files of the monitored computers via console. Surveilstar also records various kinds of activities (like email exchanges, websites browsing,document modifications, instant messaging chats...) happened on the monitored pc. 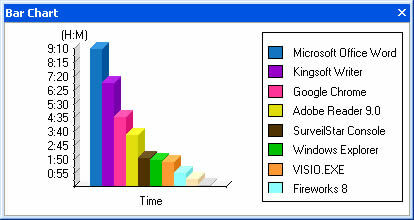 Eventually, the records will be automatically arranged by Surveilstar and generated as statistics reports. 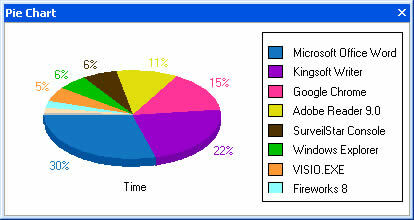 The statistics is a full list of application operating details, shown on the console>statistics. Also, the accurate employee monitoring results will be displayed with bar chats, pie chats. The two auto-generated statistics reports form can offer direct view for employers to know if the employee is doing a right job. If the entertainment records are more than the daily work, it means, the employee is definitely an absent one. What these reports can do for me? The collected data are all stored from the monitored pcs. It directly reflects the user's behavior with the computer, telling what the person has done during the past hours, days, even months. An employer can take it as a reference on determining if the employee is not abusing company sources for his/her personal affairs. Try Surveilstar 30 days trial now.